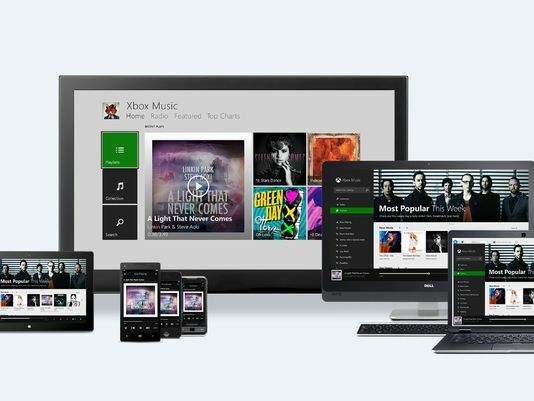 Microsoft is ready to take on Spotify in the music streaming arena. Its Xbox Music site (music.xbox.com) today begins free streaming of its 30 million-song library. Last October, Microsoft launched its Xbox Music service first on Windows 8 computers and tablets, then on the Xbox 360 and Windows phones. In addition to bringing free streaming to all Web users, Xbox Music now also lets Xbox Music Pass subscribers (who pay $9.99 monthly or $99.99 per year for ad-free music) listen and access their collections and playlists on Android or iOS devices. Those new apps are now hitting the Google Play store and iTunes App store. Next month, Xbox Music continues its evolution with special music enhancement features within the Windows 8.1 update, scheduled for Oct. 18. Any Internet Explorer web page with music- related entries can be used to create a playlist of that band or artist's songs. Search for Grateful Dead and, in addition, to getting the band's home page and Wikipedia entry among search results, there will be certain Grateful Dead songs that will crop up. Those can listened to with one click and can be saved into your Xbox Music collection. The initial Xbox Music offering was "pretty comprehensive, " says Xbox Music general manager Jerry Johnson, "but it was very limited by the device set. ... It's important that we get music everywhere the consumer wants it." For more information on the service go to Xbox.com. Microsoft currently holds just a fraction of those who subscribe to music streaming services and an estimated 200,000 by year's end, compared to Spotify's expected nearly 9.3 million, according to U.K.-based ABI Research. Adding more devices could push that potential, says ABI Research senior analyst Aapo Markkanen. And the new Xbox One video game system, due Nov. 22, will be critical to Xbox Music's success, he says. "Microsoft is clearly positioning Xbox One as an overall entertainment device, the content hub of the living room, and the music service is likely to be a key piece in that vision," he said. "A lot will ultimately depend on how well the new Xbox sells. Delivering a smooth integration with the console is the main differentiator for this service, considering how many other options consumers all around the world start to have for their digital music."